Congrats! You officially made it halfway through your pregnancy. Once women reach 20 weeks, they are often feeling pretty good—morning sickness has subsided and you aren’t big enough yet to be burdened with too much back pain and extra weight. Another exciting part of this milestone is the 20-week ultrasound, or anatomy scan. This may be your first time to see the baby, and it’s during this scan that many parents-to-be find out the gender of the baby and you get confirmation that baby is growing normally. The 20-week scan can be just as nerve-wracking as it is exciting, so we dive in to what exactly you can expect. What is the 20 Week Anatomy Scan? Although it’s something you hear about often, most women have no idea why they actually need a 20-week scan. While this scan is very focused on gender for the parents (for most, this will be when they can confirm whether it’s a girl or boy), it’s much more than that. During this scan, a sonographer will take a look at everything, from the baby’s bone structure to their heart valves, to determine whether or not they are growing correctly. They will study the heartbeat, check the amniotic fluid, and measure all of baby’s anatomy measurements. Your due date will either be confirmed, or if the baby looks developmentally ahead or behind, altered a bit to adjust with his or her growth. While they analyze baby from head to toe, they will also be looking for certain anatomical anomalies that can be seen on the scan. What Happens During the 20 Week Anatomy Scan? I went into my scan not quite knowing what to expect—some other pregnant friends and moms told me that it was strictly an over-the-stomach ultrasound, while others said they had a transvaginal ultrasound. Similarly, some said that the scan was quick and easy, while others remember being there for over an hour or more and even some having to come back on a different date because their baby was not cooperating. For me, my scan was somewhere in the middle. The sonographer did a quick transvaginal ultrasound first to measure my cervix (we still want it to be nice and long and thick at this point!) and then the remainder of the appointment was a normal ultrasound. Luckily for me, my baby was cooperating, so the sonographer was able to get a quick read on all of her measurements. She went over everything—counting fingers and toes, checking the spine, the brain and the heart. As she went, she let us know what we were looking at and that everything was looking good. Following the ultrasound, we sat down with the doctor to go over the images and ask any questions. How Can I Prepare for the Scan? There isn’t much you have to do to prepare. I was given the advice to drink orange juice or other sugary drinks about 20 minutes before the appointment to get baby moving, but most doctors will tell you to just come as you are. Make sure you are hydrated and don’t empty your bladder until you arrive—some sonographers want your bladder to be full, while others don’t. Make sure you get this confirmation before you are stuck chugging water while in the doctor’s office. You may also want to wear loose clothing and eat a balanced meal beforehand in case the appointment takes longer than you expect. Also a note: your scan will likely be done at a Periontologists office or radiology center, and most of these offices do not allow children, even in the waiting room. If you have other children, try to organize someone to watch them while you are at your appointment. I had tons of anxiety leading up to my scan thinking of this possibility. The good thing about getting this scan is that if something does show up, you have plenty of time to either fix the problem or truly understand it before giving birth. Many problems that show up during the scan, like placenta previa, end up fixing themselves before birth, so there is usually no need to stress too much if you get a bit of unexpected news. Whatever you find out on that day, be sure to ask the doctor as many questions as you can so you leave as informed as possible. 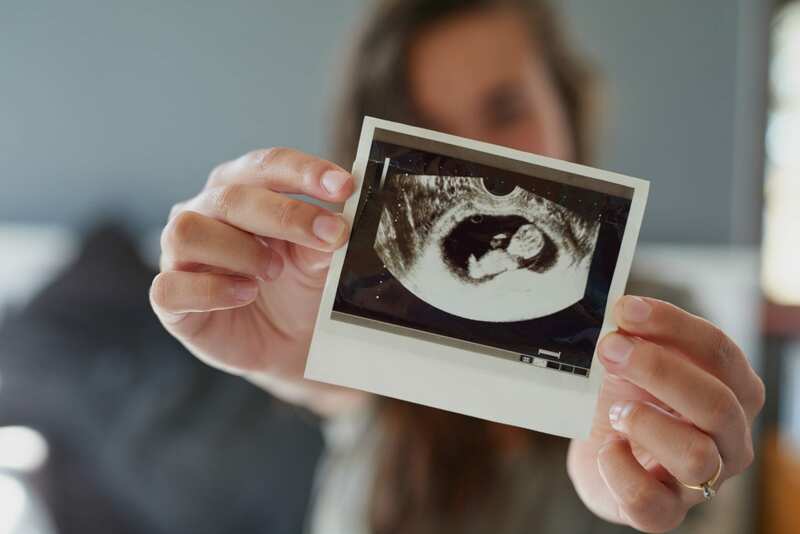 While the 20-week scan may bring a bit of anxiety for mothers-to-be, it is also a really exciting time to see your baby and possibly learn the gender if you don’t know it already. We left our appointment with adorable new pictures to show family and friends and the feeling that this is really, truly happening. 20 weeks down, 20 (ish) to go!